Background: Sleeve Gastrectomy's ability (SG) to protect against obesogenic insults is unknown. We hypothesized SG protects lean mice from obesity and diabetes after exposure to high-fat diet (HFD). Methods: Naïve C57Bl6/J mice were age/weight matched and underwent Sham or SG (n=5, 5). Post-op, mice were reared on low-fat diet for 60 days before exposure to 60% HFD for another 80 days. Oral glucose tolerance testing was performed. Comprehensive Lab Animal Monitoring Systems captured metabolic phenotypes. MRI body composition was assessed. Hepatic steatosis was assessed via Oil Red staining. T-tests and ANCOVA (mass covariate) were used. Results: In lean mice, SG did not cause lasting weight change, body composition, or food intake. 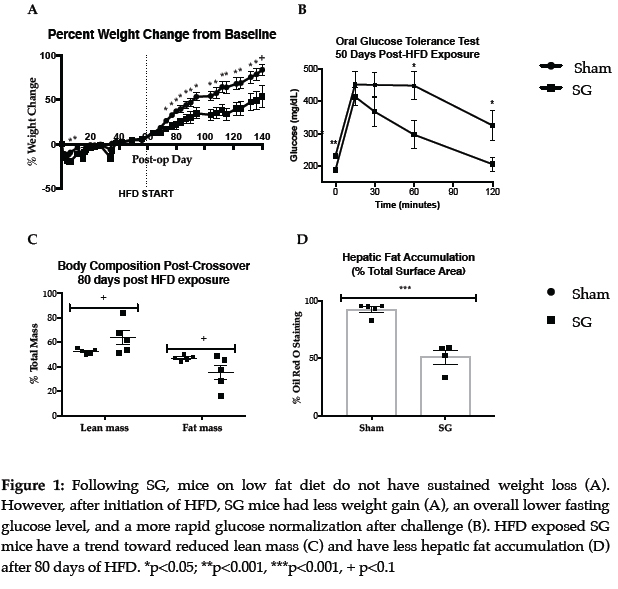 However, once exposed to HFD, SG mice reduced weight gain within 1 week (p<0.007; figure 1a). Despite equivalent caloric intake, SG mice had persistently increased energy expenditure (p<0.012; 24hr) and trended toward increased lean mass (figure 1c, p<0.1) compared to Shams. Further, after HFD exposure SG had lower fasting glucose levels (187 v 231, p<0.01) and improved oral glucose tolerance compared to Shams (figure 1b). Finally, SG mice had reduced hepatic steatosis (figure 1d, p<0.001). Conclusion: SG protects lean mice exposed to HFD from weight gain and diabetes by increasing energy expenditure, improving body composition, and improving hepatic steatosis. These data provide evidence that SG may provide enhanced protection from future obesogenic insults.